When we left California in 2002 and moved to Virginia, I had only one regret. This beautiful state of Virginia had No In-N-Out Burgers! For four years I have tried to reconcile myself to the fact that the nearest In-N-Out Burger was more than 2600 miles away. 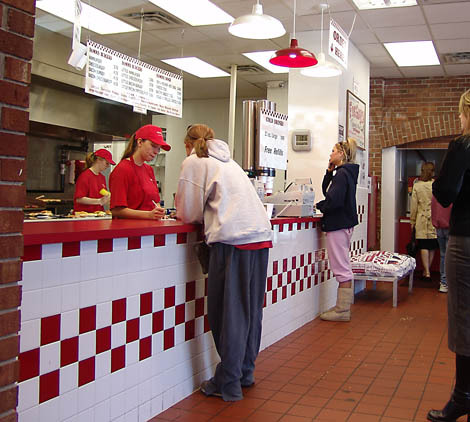 Well, today I discovered Five Guys Burgers on 880 University City Blvd in Blacksburg, VA.
After stuffing myself with one of their bacon burger and fries, I no longer pine for In-N-Out Burger. I am ready to begin my new life in Floyd, VA, secure in the knowledge that comparable burgers are available only a few miles away from home. Bright, friendly employees cook fresh high quality beef before your eyes and serve French fries that come from potatoes peeled, cut, and expertly deep fat fried on the premises. There are slight differences, of course. 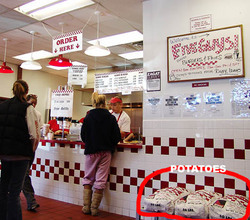 They put sacks of potatoes out where customers can see them, but you don’t have the French fry making show that In-N-Out puts on. Nonetheless, you will find memorable french fries and fine burgers under this sign. 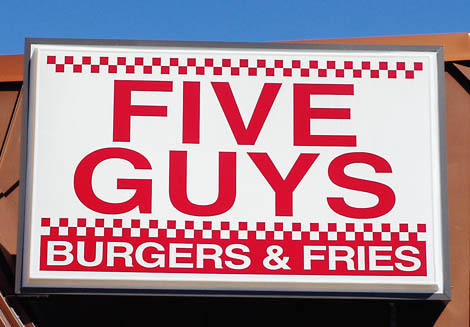 Funny you should mention that…this summer, I was in Temecula and my friend Alain took me to I & O and I immediately thought of 5 Guys here. Since 5 Guys is MY baseline, given the choice in a side by side I & O would be would be my second choice. 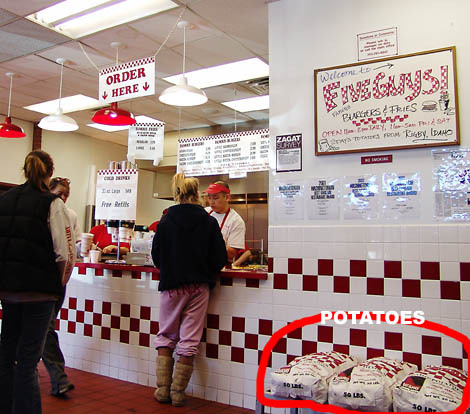 My only complaint is that 5 Guys gives you a life time supply of fries, even with a small order so that I always have to leave some. What a waste! Glad to hear you found a culinary comfort station near by. Nah, on second thought, I won’t. Sounds like BBNT in the city where I live where the person serving will remember your name next time if you go there often enough. Also the local fish & chip shop is still the best for most things. Missing your In n Out can’t be any worse than my missing my Roy Rogers; best coleslaw on the planet. lived in southern cal for 22 years, never liked i&o that much was just ok. 5 guy is as good and has better fries.